Following her escapades in Fly By Midnight, Honora Mayhem once again finds herself riding the magical Silver Train to Rawlands, this time for a weekend visit with the handsome magical tracker Ren. But when Ren fails to show up for their rendezvous at The Wolf's Den Tavern, Honora, always the investigator, goes searching for him and is pulled into a dangerous adventure where elemental magic rules. She will need all her Mayhem talents—and some help from tavern owner Roslyn Van Harbor and an eccentric gang of magical ax-wielding earth wizards—if she's going to rescue Ren and set things right in the fabled North Woods. 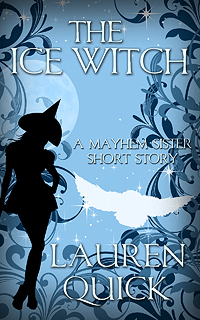 The Ice Witch is a stand-alone, short story that fits perfectly between the second Mayhem Sisters Novel, Fly By Midnight, and Midsummer Night's Mayhem, the third in the series.